Co-plaintiffs dismissed; Waterkeeper Alliance persists in appeals despite courts' rejection of claims. Imagine being summoned by a court to defend your farm against charges of water pollution leveled by an environmental group – despite that no such charges existing by U.S. EPA or your state environmental agency. And, imagine having to bear defense costs in a two-year court battle. ENVIRONMENTAL VICTMS: Alan and Kristin Hudson were targeted by Waterkeeper Alliance affiliates by aerial observation and since-disproven or unsubstantiated pollution claims. 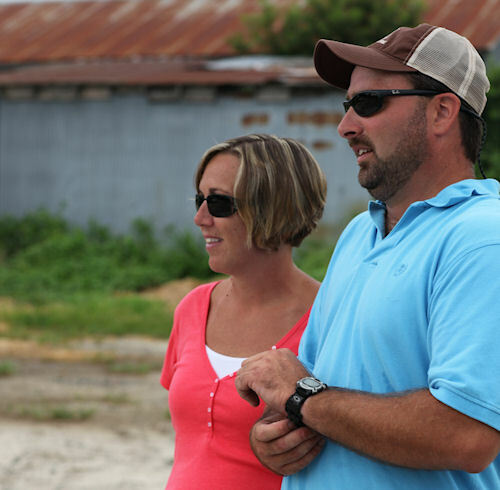 Alan and Kristin Hudson of Berlin, Md., are locked into that very struggle with New York's Waterkeeper Alliance. The lawsuit, initiated in March 2010 has dragged them through three circuit courts and Maryland Court of Special Appeals. Co-plaintiff Assateague Coastkeeper, which raises the charges to begin with, was dismissed as a plaintiff. Contrary to previous reports, the U.S. District Court of Maryland has not dismissed the case against the Hudsons and Perdue Farms. That's why the case still has a March 5, 2012 trial date, reports Chris Nidel, environmental litigation specialist for the Nidel Law firm in Washington, D.C.
"The district court never rejected the claims, and the case has not been appealed," says Nidel. "To the contrary, the arguments made by Perdue and Hudson were rejected by Judge Nickerson." Waterkeeper contends the Hudsons operate a "factory farm operation". It also charges that pollutants from poultry manure have entered local waterways via exhaust fans in the poultry houses, and via ordinary foot traffic around the poultry houses. However, unbiased documentation of those claims hasn't been produced, and the state of Maryland says the farm is operating within the law. The Waterkeeper litigation has caused burdensome legal bills, stress-related medical bills, and hindered the Hudson's ability to secure credit. To help raise much-needed funds for their defense, Wicomico County Young Farmers and Ranchers, Maryland Farm Bureau, and Perdue Farms launched www.savefarmfamilies.org to promote the Maryland Family Farmers Legal Defense Fund. Donations have been pouring in from all over the country, reports Lee Richardson, president of the Wicomico County Farm Bureau and member of SaveFarmFamilies.org. "I'm most impressed by the 950 individual donations we've received so far. This speaks volumes about both the support behind the importance of our cause. The Waterkeeper Alliance has angered a community like I've never seen before." The most recent joiners in the cause are Mid-Atlantic Farm Credit, Delaware Farm Bureau, Mountaire Farms, the U.S. Poultry & Egg Association and the National Chicken Council. "This lawsuit has reverberated throughout the agriculture community," notes Kenny Bounds of Mid-Atlantic Farm Credit. "The Waterkeeper tactics are unacceptable. The entire farming community, from grain and soybean farmers to contract poultry growers, is collectively saying 'no more'. It's clear this lawsuit is a national issue that has resounding implications for farmers everywhere." Delaware Farm Bureau quickly recognized that the lawsuit impacts more than Maryland family farms. "We have a strong desire to fight this misguided litigation," says Gary Warren, a Middletown, Del., farmer and president of the Delaware Farm Bureau. "The Waterkeeper lawsuit against the Hudsons warrants broad resistance." The Waterkeeper lawsuit exposes their true agenda – putting family farms out of business, contends John Starkey, president of U.S. Poultry & Egg Association. "We felt compelled to aid in the Hudson's defense." Poultry producers have enough economic challenges, adds Mike Brown, president of the National Chicken Council. "Allowing the Alliance to add this type of totally unnecessary and very unfortunate weight to that daily burden is beyond a reasonable person's comprehension." To learn more about the case, visit www.savefarmfamilies.org.